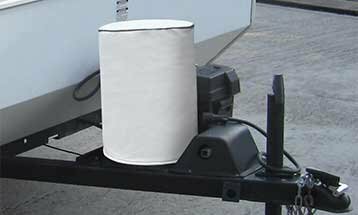 An accessory that is often overlooked is a cover for the propane tanks on your RV. Covering the tanks while your unit is in storage will protect the valves and tubing from harmful UV rays and help prevent your tanks from rusting. It is important to cover the tanks in hot weather to help reduce the expansion of the gas, which can lead to inaccurate gauge readings. A cover also protects the gas bottles from dents and dings and from being tampered with. Our Propane Tank Covers are made by ADCO and are constructed from deluxe heavy–duty vinyl. They feature a molded nylon zipper that allows for access to the valves and a pressed wood top for a more rugged, weather-resistant cover (wood top and zippers not available on single size). Hollow bead welting and elastic shock cord give the cover a neat, tailored fit and extended life. Propane tank covers are perfect for those of you who use your tanks while camping, tailgating, or for storage. Keep your controls dust and grime free by covering your tanks. Propane tank covers are water repellent and UV resistant. These covers come standard with a 3 year warranty. We keep propane tank covers in stock and in most cases they can ship the day you order!